Are you ready to upgrade the bathroom in your heritage home? If so, you’ll want to start brainstorming design ideas as soon as possible. 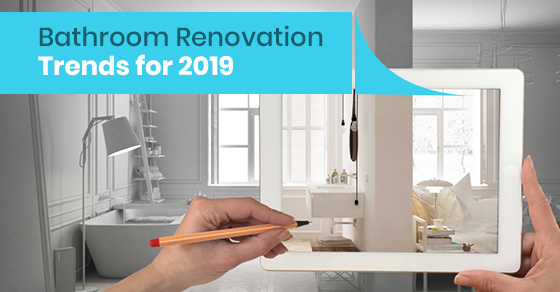 If you’re keeping an ear open for the upcoming trends, take a look at what the best bathrooms look like for 2019! There are many ways to make an area “pop” in the bathroom, but one of the most popular methods moving into the new year is making use of statement tiles. These can be introduced as part of the flooring or even an entire wall within the shower. Don’t be afraid to bring in some bold colours to complement the neutral tones while still giving the space a cohesive look and feel. While exploring colour options, do not forget to consider the shapes as well – for example, using hexagonal or diamond shaped tiles can bring in a unique geometric look. In one of the latest tile trends, chevron tiles have been recently utilized in both flooring and backsplashes to bring a livelier feel to the bathroom. It should come as no surprise that the use of textures continues to be important in the role of creating the perfect bathroom renovation. Using wood accents or terracotta tiles could evoke warm feelings and comfort, giving it a homey feeling even immediately after renovation. Some ways we’ve seen texture effectively used to bring forward this cozy comfort is through wood panelled ceilings, light natural hues, and wood grain vanities. We all want to be comfortable in our bathrooms, even immediately after a home renovation. Avonlea understands the importance of creating a warm and inviting atmosphere and embraces the process of finding the right textures to suit the theme you choose. As far as backsplashes designed for the modern day bathroom, you can’t go wrong with delicate, intricate patterns. We are seeing these on many floor and wall tiling installations in the latter half of this year. In contrast, there has also been a recent return to bold black and white floor tiles. Patterned wallpaper is also making a return; this works well with themed rooms to help create the right atmosphere for almost any setting you can imagine. One example of this is using large format floral wallpaper to create a romantic feeling around a gold-detailed bathroom mirror. In 2019, technology is such a critical part of our lives that by now the only next logical step is to integrate it into our bathrooms. It can something as simple as heated flooring, or building lights into bathroom fixtures. We’ve seen lights installed in places such as under the counter or behind the mirror. The next step up from that would include incorporating motion sensors to trigger the lighting. The use of technology in the bathroom can also become more advanced such as adding touch screens into the shower with access to music linked to speakers built into the walls, water pressure changes, or water temperature presets. Finally, don’t forget our personal favourite, the heated towel rack. Never go without a warm and dry towel again! For more information about how to incorporate these trends into your next bathroom renovation, call Avonlea Kitchen Renovations and Design at (416) 907 4764 or contact us here.